This map of the Nebraska and Kansas territories by J. H. Colton shows forts, villages, missions, Indian lands, and various routes including the northern, central and southern routes of the Pacific Railroad; the Oregon route; the Santa Fe route; Cook's wagon route; Conde & Bartlet's route; and the route to Fort Smith. The map also includes an inset of parts of North, Central and South America; and the territory acquired from Mexico through the Gadsen Purchase. Woodcut illustrations include Indians, wolves, bear, deer, beaver, buffalo hunting, and settlers with wagon. 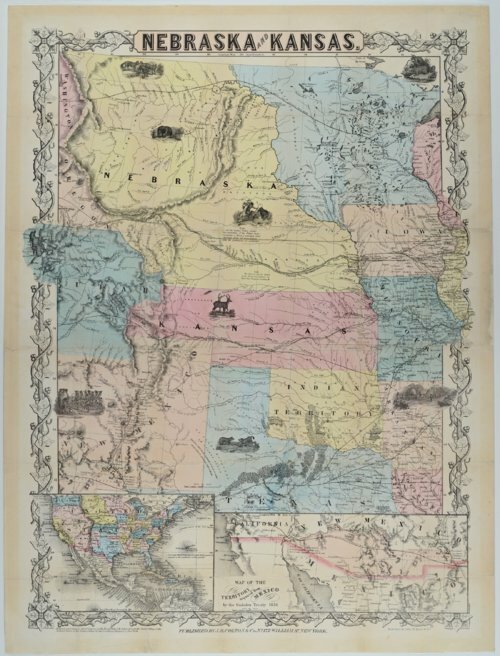 The Kansas-Nebraska Act (1854) provided that each territory would decide whether or not to allow slavery through the constitution under which it would enter the union. In Kansas, this approach to managing the expansion of slavery (know as "popular sovereignty") precipitated a battle between proslavery and antislavery forces known as "Bleeding Kansas." This map is provided through a co-operative project between the Lecompton Historical Society and the Kansas Historical Society. Partial funding was provided by the Ross and Margaret Wulfkuhle Charitable Trust and the Freedom's Frontier National Heritage Area. Copies of this map are available for viewing at both the Kansas Historical Society and Lecompton Historical Society.